“What is ‘green yogurt’?” Jezebel editor Emma Carmichael asked our Slack messaging room. “Yogurt made from vegetable runoff,” Aimée Lutkin replied. “No I made that up,” Aimée said. That we believed her is darkly telling; we certainly have reached a point in society when something already considered healthy (yogurt) and already considered disgusting (by me) would be transformed into something even healthier (green yogurt) and even more disgusting (made from vegetable runoff). Still, the question goes unanswered. 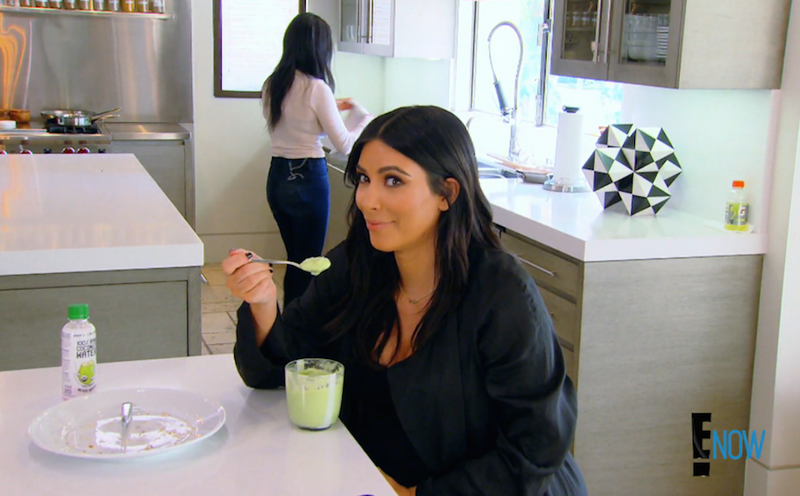 Could People Great Ideas be referring to Kourtney Kardashian’s “avocado pudding,” which is absolutely green, absolutely of a yogurt-like texture, and reportedly very gross? This could be what People Great Ideas is referring to, but it would be extremely rude of Kim (and/or People Great Ideas) to have referred to Kourtney’s avocado pudding as anything but avocado pudding, because Kourtney invented* it and christened it avocado pudding and she should be able to rely on her sister to promote it as avocado pudding. Did People Great Ideas confuse Green yogurt for green juice? No, I don’t believe this is possible. Is People Great Ideas referring to this Google image of a cup of dark green Oikos Greek yogurt? Hard to say. The image comes from the blog of a couple named Rob and Kristen, owners of a trimaran sailboat called No Smoking. Rob and Kristen fed this green yogurt—curd mixed with spirulina powder—to stray dogs in South India. Is People Great Ideas simply talking about green-flavored yogurt, such as lime Chobani, or Plum Organics’ green bean, pear, and Greek yogurt baby food, which is similar to the baby food Camila Alves was seen eating a few days ago? Could be. Did People Great Ideas mean to say “Greek,” as the capital ‘G’ in “Green” and the fact that Green yogurt doesn’t exist would indicate? Almost definitely, but I have reached out to @greatideas for confirmation and will update if I hear back. UPDATE, 11:20 AM: It was a typo.